To use the carbon fiber brush, place your record on the turntable, power on to start rotation and gently position the brush on the surface of the record while it rotates. As the record rotates, carefully slide the brush towards you after several rotations to remove any collected debris. This process may have to be repeated several times to achieve optimal results. To clean the brush after use, simply rotate brushes bristles back and forth against underside of handle. If your record is visibly dusty make sure to wet the record first to avoid any damage to the brush or the surface of your vinyl. To use the velvet brush, first mist the record with the cleaning spray that's included with the kit, power on your turntable and place the brush on the record while applying light pressure to the brush as the record rotates. For best results, allow the cleaning solution to dry before dropping the needle. To use the cleaning spray, simply apply 3-5 squirts onto the surface of visibly dusty records before using the velvet or microfiber brush. To use the stylus brush, gently swipe the stylus from back to front until it's free of debris. KEEP YOUR VINYL SOUNDING AWESOME: Hearing unwanted background noise while listening to your records? Chances are your vinyl has debris built-up in it's grooves. With this 5 piece kit you'll be able to remove every last sound depleting particle from your vinyl, creating an amazing listening experience. 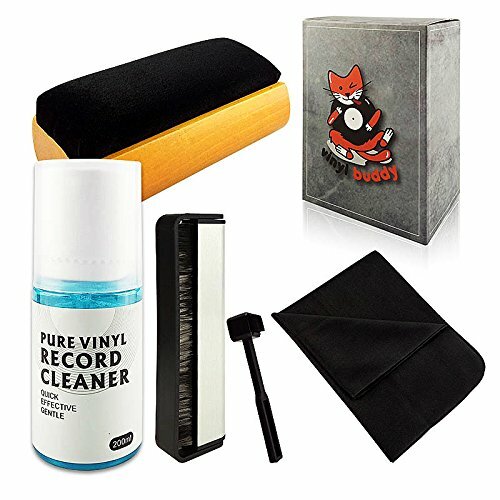 INCLUDES EVERYTHING YOU NEED: This record cleaning kit includes all the benchmark essentials for a spotless and rich sounding vinyl collection. In this kit you'll receive a Velvet Brush, Microfiber Brush, Stylus Brush, Cleaning Solution and a Microfiber Cloth. With these tools you'll be able to tackle any cleaning session with ease and perfection. SAFELY CLEAN YOUR VINYL: Vinyl Buddy's products are vigorously tested to ensure maximum quality and user experience. Each product is crafted from the safest possible cleaning material, ensuring the greatest possible prosperity for your vinyl. PERFECT FOR SERIOUS CLEANING SESSIONS: This kit was designed to tackle even the dirtiest collections. Each product in this kit works together to remove every last particle that's embedded in your records grooves, leaving you with the highest sound quality for your enjoyment. If you have any questions about this product by Vinyl Buddy, contact us by completing and submitting the form below. If you are looking for a specif part number, please include it with your message.